GROSSMONT COLLEGE – If human life is important then the subject about which Grossmont’s own Dr. Wendy Stewart spoke at length is easily among the most important topics imaginable: the water-shortages in Africa. These shortages are the #1 cause of death in the world: an estimated 12 million people – each year – mostly children. The #1 cause of death in the world is dehydration. However, the death-by-dehydration often comes not from from a lack of water but from the drinking of undrinkable water: this causes serious diarrhea, dehydrating the person’s body, causing (terribly painful) death. The most alarming part: water is – in many cases – readily available, even closer to the surface than water here in the U.S. This means that shallow, relatively inexpensive wells could save millions of lives – each year – in Africa. GROSSMONT COLLEGE, — Eric S. Smith spoke to scores of GC students Monday, Feb. 14 as part of the school’s observance of Black History Month. Smith’s was a message of optimism amidst a life filled with challenge. He concluded his speech by reading a section of his book, which he prefaced with the following words: “I am about to read some of my own words, and just remember: you have words too. You, each, have something to say. And never think that you words are any less important than someone else’s.” Smith will speak again tomorrow, Feb. 15 in room 220 beginning at 8:15 a.m.
GROSSMONT COLLEGE — The President of Egypt, Muhammad Hosni Sayyid Mubarak has stepped down, after nearly three decades of what plenty consider to have been a corrupt dictatorship. Here on campus, there are strong opinions as well. “It is great for Egypt and the Middle East…Mubarak was a dictator…and after 30 years years he is leaving, because the Egyptians were brave enough to stand up,” said Sharifa Hagi, a Grossmont student of Yemeni descent who hopes that the events in Egypt will encourage change in other places, among which she named Yemen, Tunisia, Somalia and Sudan. PASADENA CITY COLLEGE (Press Release)—The Speech and Debate team of Grossmont College traveled to Pasadena City College (PCC) for a Speech and Debate tournament, on Oct. 16 and 17. Once the dust settled, teammates Ali Aldhalimi and Russ Lindquist won the bronze in novice Parliamentary Debate. Additionally, Aldhalimi and Lindquist won awards for ‘overall speaker’ in the same event – 6th and 5th place, respectively. And Lindquist ‘broke’ into the final rounds for novice impromptu speaking. The other Grossmont Speech and Debate team-members who competed were Courtney Gerlach, Jesse Gault, Jonathan Parker, Jonathan Smith, Maria Torres, Diana Trinidad. 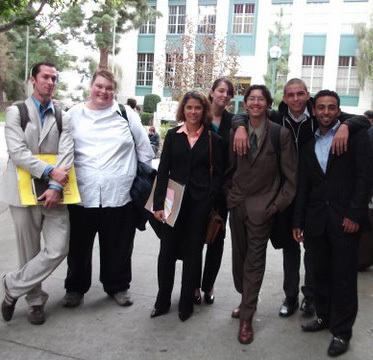 Though only Aldhalimi and Lindquist ‘broke’ into final rounds in events, the entire team is now fired-up and intending to do their respective bests at the upcoming Griffin Tournament, here at Grossmont, Nov. 27 and 28, according to Speech Prof. Roxanne Tuscany.